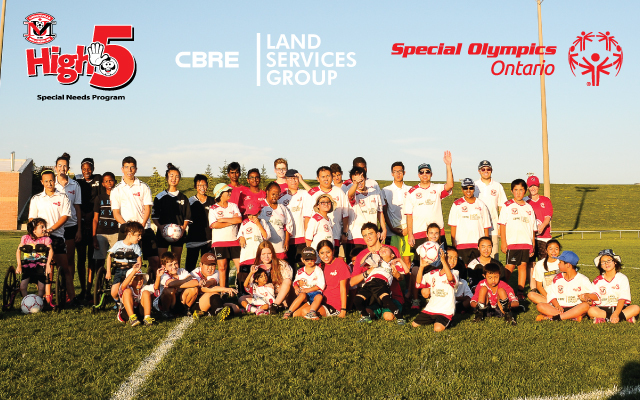 UMSC's High-5 All Abilities Team - Proud to Partner with Special Olympics Ontario! Welcome to the UMSC High-5 All Abilities Team! Unionville Milliken Soccer Club’s High-5 Team is an inclusive program encourages fun and fitness, and promotes skill development, leadership, independence and self-confidence. Players are placed with youth/adult “trainers”. We strive for a 2:1 or 1:1 ratio for players who work best in that environment and a 3:1 ratio for players who would like to participate in small sided games. Each player is unique and their program is customized for them. FUN! Your son/daughter will get exercise, touches with the ball and learn new skills each week in a positive, energy filled environment. SOCIAL! Being on a team is a great feeling, and our High-5 Team is UMSC’s most important team! Players and Trainers create a true bond of friendship, both learn from each other and look forward to seeing each other each week. PHYSICAL! Exercise is important for everyone, the High-5 Program encourages your son/daughter to run, jog, jump, pass, throw, stretch… each practice consists of a warm up, individual skill session and the opportunity to play in a small sided game or continued 1:1 practice. All practices end with a cool down, stretch and the famous “I LOVE HIGH-5 CHEER”! YOU TIME! Parents we recognize that you need some downtime and encourage you to come to High-5 and relax with other families in the community while your son/daughter is having a great time. PLAYERS AND TRAINERS! The unique structure of our program means that we strive to have 1:1 player to trainers. If we have 40 players we strive to have 40 volunteer trainers, that is a lot of love, energy and fun packed into one hour! Our youth trainers make it so much fun for the players since in many cases they are fairly close in age. This creates a really fun & caring environment that your player can grown in. The High-5 Team starts on Friday, June 14th and runs until August 23 (except on the Canada Day long weekend & the Civic Holiday long weekend). We do run in light rain, but if there is heavy rain or if the fields are too wet we need to cancel and do not have the ability to have a make-up date. A special thank you to our sponsor, CBRE's Executive Vice President Mike Czestochowski. Thank you for being a champion for the UMSC High-5 Special Needs Family!